One year ago today I was overcome with the realization that my life was overrun with the reading and watching and following of blogs. So I knew the time was right for me to start a blog of my own. A years worth of blogging for me has been 86 posts, 135 follows and and countless plans for a more successful year 2! 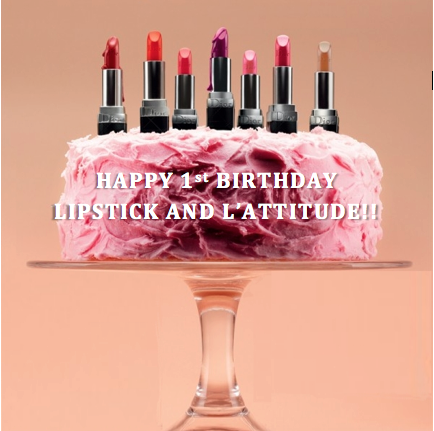 As much as I would love to have blogged more, and am always hoping for a few more follows, I’ve been quite proud of what Lipstick and L’Attitude has developed into, and I’m looking forward to what my second year of blogging brings me! So stay tuned for more my friends, and thanks for reading!! Happy 1st Birthday! Looking forward to all of the posts.